The aluminium Clic C183 Necklace consists of one subtle matt silver and one black stick that overlaps and connects. The sticks are connected by a fine stainless steel wire. The sticks are attached by means of a magnetic mechanism. The invisible fastening on the front of this necklace makes it unique. It’s always a surprise how your necklace closes: Find the right click! The aluminium Clic necklace C183 gives a subtle yet strong accent due to its shape and colour contrast. The shape – with the point facing down – enables the necklace to sit beautifully on the neck and fit perfectly in the collar of a blouse. Emphasize the feminine shape of your neck with this elegant necklace. This Clic necklace C183 is available in various colour combinations: silver with black, red or purple. The necklace can be excellently combined with the Clic A1 or A2 bracelet and the Clic 021 or 028 earrings, which are also available in the same colour combinations. 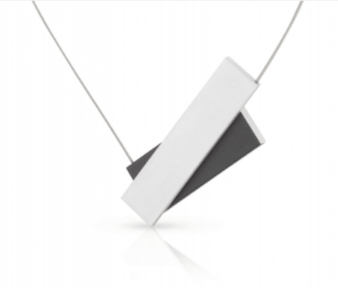 This necklace fits the Dutch minimalistic design school. The powerful geometric shapes are surprising in their simplicity. The form language of this jewelry continues to fascinate thanks to the emphatic modesty of the designs. 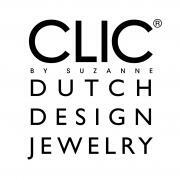 A Clic necklace always consists of two parts. They close at the front with a magnetic clasp. Designer Suzanne Schaars uses modern materials in her jewellery designs, exclusively using aluminium, stainless steel, and magnets. Suzanne’s design philosophy is based on two principles; her jewellery is highly comfortable to wear and has invisible clasps. To ensure the comfort of wearing, the Clic C183 necklace is made of lightweight and anti-allergen aluminium and stainless steel. The necklace opens and closes easily and safely with the magnet clasp at the front. Suzanne Schaars works from her personal motto ‘enjoy life and create beautiful things!’ In this motto, she finds the motivation for designing creative new bracelets, earrings and necklaces and for improving her existing designs. She finds inspiration for her Clic by Suzanne everywhere she goes and at the most unexpected times. She often comes up with her best ideas when she is not actively working on a design. This was also the case for the Clic Necklace C183. Clic necklaces are available in various geometric shapes. Alongside this subtle necklace, there are also other items with large or small geometric ornaments. Purchase this aluminium necklace in combination with one of the bracelets or earrings by Clic by Suzanne and make your geometric jewellery combination complete!